You learn something every day. This fresh, golden brew from the Monteith Brewery in Greymouth, NZ has an aroma of zingy lemon and fresh puppies. Upon tasting, the first thing that springs to mind is ‘shandy’. There certainly hints of lemonade and plenty of fizz, making an ideal drink on a hot summer’s day. So, ‘where’s the learning?’ I hear you ask. Well, I wasn’t really sure what a ‘Radler’ was and so I asked Dr Google, who in turn, referred me to Prof. Wikipedia. The good professor then informed me that a ‘radler’ “is a beer-based mixed drink (Bermischgetränk) with a long history in German-speaking regions. Consisting of a 1:1 or 3:2 mixture of various types of beer and German-style soda pop or lemonade“. Ergo a shandy. 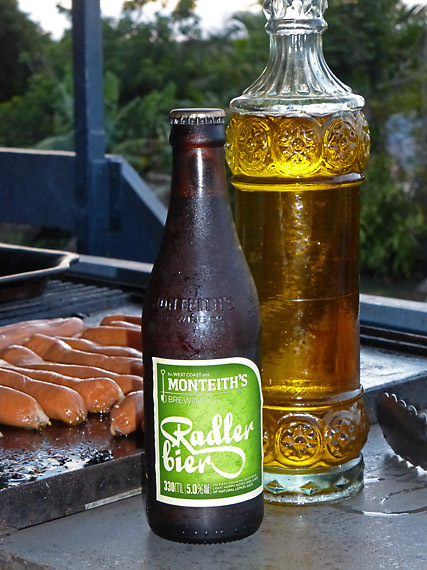 Monteith’s Radler Bier – the world’s first 5% shandy? However, if this really is shandy in sheep’s clothing, it’s a real good ‘un. Light, sweet and refreshing, it has an ABV of 5%. Could this be the world’s first 5% shandy? Ein uber biermischgetränk, ja?